Welcome to your crash course in phrases of the dependent variety! Do you feel like you’re at school, yet? Don’t fret, there’s no test. This time. Let’s start with the basics: What is a phrase? A phrase is a word or group of words that expresses a single concept within a sentence. It is dependent, which means it cannot stand alone. I’ll include an example sentence and explanation for each type of phrase. Be sure to notice that with each phrase addition, I’m either giving extra details about the characters or hinting at their emotions. An appositive phrase is one of the easiest phrases to add. It simply renames a noun or pronoun right beside it with another noun phrase. It uses commas to separate the phrase if the additional information is nonessential. “Oh.” Naomi, the third receptionist at the company in three months, dropped her pen. “Um, he uh- he… resigned a couple days ago.” She whispered as their boss, a broad-shouldered man with a trim goatee, walked in. Each of the above appositive phrases rename the nouns beside them (Naomi and boss). The reader is given a bit more information about each character. With the first phrase, the reader may also start wondering why Naomi is the third receptionist in three months. We add prepositional phrases to our writing often without thinking about them. They begin with a preposition, and they act as a noun, adjective, or adverb within the sentence. As you can see, you have a multitude of choices here. According to English Club, there are upwards of 150 different words that can be used as prepositions in the English language. “Oh.” Naomi dropped her pen and reached under her desk to retrieve it. “Um, he uh- he… resigned a couple [of] days ago.” She pulled her wavy brown hair from her eyes and clicked her pen. Don’t worry here either… I won’t get into the different kinds of prepositional phrases or the variety of questions they can answer. A participial phrase is a formed from a derivative of a verb using either the past or present participle. In short, a participle usually ends in either -ed or -ing. These phrases function as adjectives in a sentence. “Oh,” Naomi said, reaching under her desk for the pen she dropped. “Um, he uh- he… resigned a couple days ago.” Clicking her pen,she pulled her wavy brown hair from her eyes. These phrases offer the reader a chance to see Naomi’s reaction as she speaks. At first, she’s struggling to hold onto a pen that she uses every day during this conversation, which gives insight into her nervousness of the topic. Then, she’s focusing on the pen and her hair instead of the person to whom she’s speaking. Pause right here before reading any further. 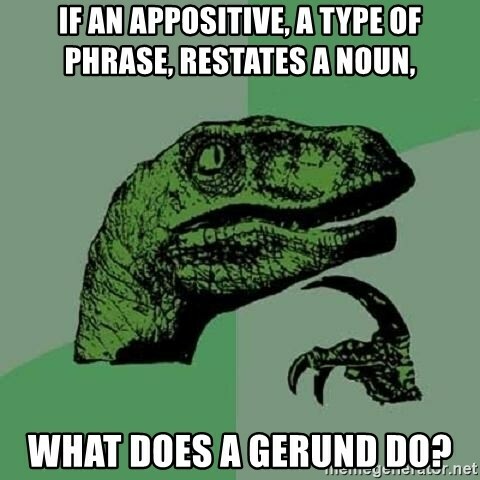 A gerund is a verb that acts like a noun in a sentence. (Say what?) It uses the -ing suffix, and it’s often found right after a verb unless you place it at the beginning of a sentence. Okay, enough crazy talk…. Each of these phrases give insight to Naomi’s internal conflict. She doesn’t know what should or shouldn’t be said, so she’s dealing with it through her pen. 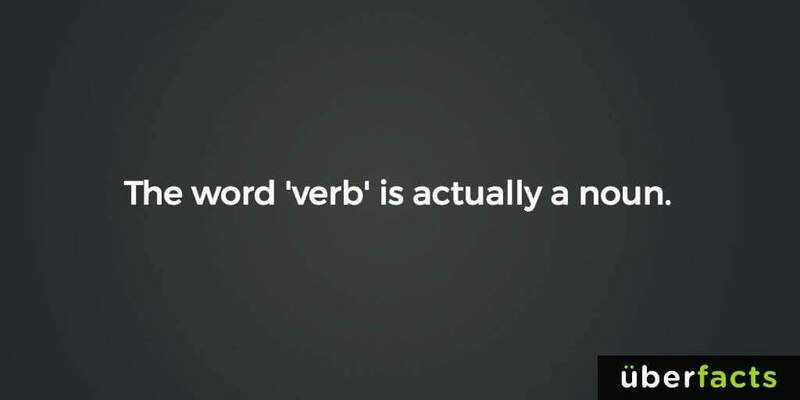 Don’t shoot the messenger, but I have another verb for you that acts like a noun in a sentence. Say hello to the infinitive, which contains the words ‘to’ plus a verb (to breathe, to write, to laugh). Helpful hint: Look for the word ‘to’ in your sentence. If it is followed by a verb, then it is part of an infinitive. If it isn’t followed by a verb, then it is a preposition. “Oh.” Naomi dropped her pen and reached under her desk to retrieve it. “Um, he uh- he… resigned a couple days ago.” She pulled her wavy brown hair from her eyes and clicked her pen to avoid further discussion. In most cases, an infinitive answers a simple question: Why? You can see that question answered in both of the instances above, which allows the reader to better understand ‘why’ she is doing what she’s doing. We finally have a noun! However, a noun phrase doesn’t only include a noun… We also have to include all its modifiers: article, adjectives, pronouns — oh my! “Oh.” Naomi dropped her favorite purple and gold fountain pen and reached under her desk to retrieve it. “Um, he uh- he… resigned a couple days ago.” She pulled her wavy brown hair from her eyes. In this instance, we simply look for the nouns, and we determine what needs clarification. These details could explain the motivations behind the character’s actions (her favorite pen — which no longer clicks in this scenario) or detail her physical attributes (wavy brown hair). Detailing the nouns allows you to create a vivid description of your character’s life. The other modifiers are the obvious adverbs and the less-obvious preposition (they like to tag along occasionally). “Oh.” Naomi abruptly dropped her pen. “Um, he uh- he… resigned a couple days ago.” She would have pulled her wavy brown hair from her eyes, but their boss showed up at that moment. These phrases are often short, but they provide you with a bit of insight into characters, too. Notice that Naomi was only considering pulling her hair back this time, which asks the reader to visualize her hands stuck in midair as the boss walks in. The reader may also question this sudden action. Here’s a handy guide for you that I keep in my classroom! Please feel free to share your comments and/or resources with me below! This post is part of the #AuthorToolboxBlogHop (hosted by Raimey Gallant), which is dedicated to helping writers become stronger and more confident in their craft. Click here for more information, to continue hopping through other posts, or to join in! Posts like this remind me how much my English teachers didn’t teach us in high school (it wasn’t their fault: they were working to a national curriculum that valued having ideas over the ability to use correct grammar when articulating those ideas). I read Spellbinding Sentences this year and last, and it’s amazing even with having done that, how much I needed this refresher. Thanks! No problem! I’ll have to check that book out — thanks for the title! Yay, grammar! Thanks for this informative post. At a writers’ conference I attended, one of the speakers likened grammar to hygiene. It doesn’t matter how interesting you are, no one will want to talk to you if you have poor hygiene. Similarly, no one will want to read your story, regardless how intriguing it is, if it uses poor grammar. We are definitely builders! Thanks for commenting! I’d love to know about this song! Really educational post. I’d never heard of any of these types of phrases before! Great educational post! Before reading this, I could only name four types of phrases. “As it turns out, I, a part-time writer, am a big user of participial phrases in dialogue tags,” I said, choosing to clumsily illustrate three types of phrases. I hear you on the participial phrases in dialogue tags! Great job on your phrases!